A suave design, appropriately complemented by an incomparably deep crimson color such as to project irresistible appeal. The band is crafted from 925 sterling silver with a circular shape turning into a receptacle at the top where the gemstone sits. 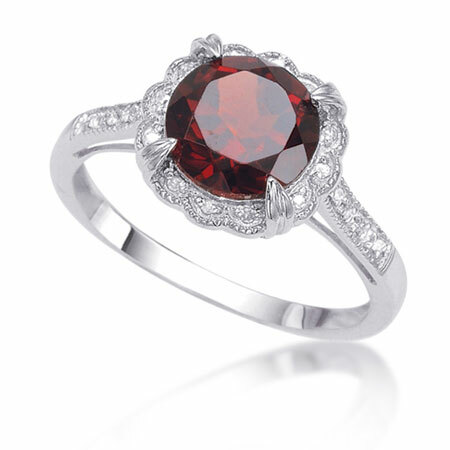 The 1.79 Carat garnet stone resides on a sterling silver base with scalloped edges. The surface of the base is encrusted with 0.06 Carat diamonds and right in the middle is the round-cut crimson colored garnet stone, resplendent in its beauty and shimmering in the allure created by the full complement of diamonds surrounding it and lining all the way from the band to meet the base. We guarantee our 1.79 Carat Garnet and Antique-Style Diamond Halo Ring in Sterling Silver to be high quality, authentic jewelry, as described above.